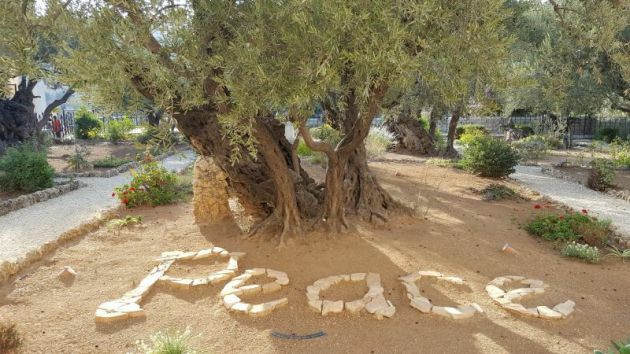 (Photo: © Loyola Ranarison / WCC)Olive tree from the Garden of Gethsemane where Jesus prayed with his disciples the night before his crucifixion in Jerusalem. Photographed in 2017. Pope Francis has spoken of the "absurd contradiction" negotiating for peace while at the same time pushing arms sales while World Council of Churches leader Olav Fykse Tveit led prayers for peace in Jerusalem on the 50th anniversary after the end of the six day war that led to the occupied territories in the Holy Land. Both were speaking for peace in unrelated acts around the Pentecost celebrations when Christians celebrate the descent of the Holy Spirit on the followers of Jesus a few weeks after his death and resurrection. The Pope released a video message accompanying his monthly prayer intention for June with the intention to seek the elimination of the arms trade. "It's an absurd contradiction to speak of peace, to negotiate peace, and at the same time promote or permit the arms trade," says Francis. "Is this war or that war really a war to solve problems, or is it a commercial war for selling weapons in illegal trade, and so that the merchants of death get rich?" he asks, as images of explosions and gunfire interchange with frames of the leaders shaking hands dripping with blood. "Let us put an end to this situation," he said. "Let us pray all together that national leaders may firmly commit themselves to ending the arms trade which victimizes so many innocent people." In a comment on the website of Catholic News Agency in response to Pope Francis' message DAJM Howard wrote, "I will not. I will pray for responsible arms trade. Rocks don't work against ISIS." In Jerusalem on June 5, World Council of Churches' Tveit made his peace plea preaching at a prayer service in Jerusalem for justice and peace in the Holy Land on 5 June at the Dormition Abbey in Jerusalem during Pentecost celebrations. The fellowship and unity that Jesus' disciples once experienced praying together during a time of fear in Jerusalem at Pentecost "spelled a new beginning" for the mission of the Church, he said in a reminder to Christians worldwide from the Holy Land. "It happened to a community in fear. They lived under occupation and oppression.... The signs of the Holy Spirit described in the Pentecost story points indeed towards unity and just peace," noted WCC general secretary Rev. Olav Fykse Tveit. The prayer, initiated by church leaders in Jerusalem, is being held worldwide 50 years after Israel began its occupation of East Jerusalem, the West Bank, the Gaza Strip and the Golan Heights after a six-day war in 1967 by Israel and the neighbouring states of Egypt, Jordan, and Syria. Jerusalem is a holy city and it has been for Christians over centuries and even millennia said Tveit, noting, "So it is also today. Followers of the three Abrahamic religions, Jews, Christians and Muslims see this as a holy city and pray here to the One Holy God." The World Council of Churches called for Christians all over the world, while they are celebrating the feast of Pentecost, to join in a prayer for justice and peace. "The Holy Spirit creates our lives every day, renewing the face of the Earth, as Psalm 104 reads. The Spirit of God, 'the Lord and Giver of life', breathes into our world so that there is life in each one of us," explained Tveit. Tveit said that in praying to God people cannot ignore the consequences for how they relate to one another. "Jerusalem carries the name of peace. Yet we know that the people of Jerusalem and in this area are not living in peace today. Pentecost this year comes at the same time as we here mark 50 years since the war that led to the occupation of East Jerusalem, the West Bank and Gaza." Tveit said, "The occupation has not ended. It is manifest in military rule, in discrimination and violations of human rights. "It is also manifest in the building of settlements and infrastructure that are against international law - making it more of colonization than mere occupation. This must end for the sake of just peace for all the peoples living here, for Palestine and for Israel." "Praying to God makes us accountable to one another as God's creation, created in the image of God. The One God calls us to unity and to justice and peace with one another... The Holy Spirit creates life for unity. "Like at the first Pentecost, our faces, our voices, and our actions can express praise to God in a way that can create fellowship and unity. God can be worshiped in Spirit and truth everywhere. That is why we pray together here – and in any place in the world."